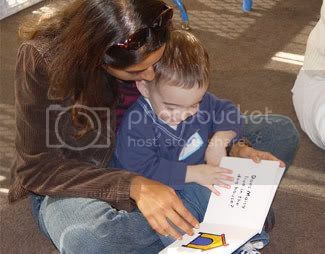 A mother and child take part in a ´baby book club,´ part of the Shalom Baby program of the Lawrence Family Jewish Community Center of San Diego. NEW YORK (JTA) — It wasn’t long ago that the Jewish organizational world came to grips with the idea that the best way to reach unaffiliated families was by getting them to enroll their toddlers in Jewish early-childhood programs. But a new study says it’s even better to get to them as soon as their babies are born. Released in November by Brandeis University’s Cohen Center for Modern Jewish Studies, the study looked at programs in 10 Jewish communities aimed at engaging first-time Jewish parents. Statistically, American Jews become parents later in life than the general population — often after both parents are professionally established — and new parenthood involves a certain amount of social isolation, according to Mark Rosen, who conducted the study. Parents often need something to ground and assist them in the period of upheaval after childbirth, Rosen said, and if the Jewish community can provide proper programming, it can engage parents in the community long-term. Rosen conducted on-site interviews with some 100 professionals running programs such as Shalom Baby — through which federations give parents gift baskets shortly after their child is born — and Parents’ Place, a drop-in resource center of the Jewish Family and Children’s Services of San Francisco that serves about 30,000 people a year. The most effective programs offer parents support from peers, Rosen said, since several sets of parents moving closer to Jewish involvement at the same time can provide momentum. But much of the success is predicated on hiring a good professional who cares about the parents with whom he or she is working, Rosen said, adding that it’s often best to run programs outside of synagogues because they can be intimidating for the unaffiliated. The key is creating programming that’s engaging not just for children but for parents, he said. It’s a technique employed by Chabad-Lubavitch. Chabad rabbis, who are charged with personally reaching out to every Jew in the vicinity of their outposts, typically set up discussion groups for young parents, according to Nachum Kaplan, director of Chabad’s central education office. Those meetings break the ice and help feed children into Chabad’s 160 early-childhood programs, a number that has doubled in the past six years, Kaplan said. Where young parents are tends to be centered on their children. Chabad has more than 7,000 children enrolled in early-education programs, which means it has some 5,000 families it can reach through them, Kaplan said. The eight volunteers working the Shalom Baby program of the Lawrence Family Jewish Community Center in San Diego have contacted some 1,300 new parents since the program started five years ago, coordinator Judy Nemzer said. Each year the volunteers distribute 270 to 300 baskets containing candlesticks, grape juice, toys, tzedakah boxes and a series of publications about raising Jewish children, along with information about JCC programming. In a survey completed in September, the JCC found that 83 percent of those who received the baskets responded positively, 78 percent intended to enroll their children in Jewish preschools and 78 percent planned to join a synagogue. Before the parents were contacted, only 29 percent had been affiliated, according to data from local gynecologists and word of mouth, Nemzer said. The San Diego JCC has found that play groups are among its most successful infant programs. It now has 35 such groups, each with 15 to 20 mothers, Nemzer said. In Denver, 50 out of the 200 children enrolled in the Robert E. Loup Jewish Community Center’s preschool had been participants in Shalom Baby, according to Caron Blanke, who runs the program there. Such programs can be cost-effective because they are volunteer-based, Rosen said, yet few communities use the programs and they are often underfunded. Rosen’s study is being examined by a number of Jewish educational and outreach institutions as a way to bring empirical evidence — and attention — to a trend they’ve already noted. The Partnership for Excellence in Jewish Education, a foundation dedicated to improving Jewish day schools, has been working to develop “pipeline grants” to get day schools to form relationships with local early-childhood centers to feed children into the schools, executive director Rabbi Joshua Elkin said. Doing so brings a Jewish child’s potential entry point into the day-school system to about 2 years, 9 months, Elkin said. Rosen’s research, though, brings the entry point down to birth. “Mark’s research points at a much bolder direction,” Elkin said. Still, the need to reach out to these families is greater than what the organized Jewish world may know. The 2000-2001 National Jewish Population Survey suggested that there were about 45,000 to 50,000 Jewish families with newborns, according to Len Saxe, director of the Cohen Center. Allowing for methodological errors in the study and for differing definitions of what it means to have a Jewish baby, Saxe said the actual number of such families could be twice as high. Reaching out to new parents has become a key tactic in bringing interfaith families closer to the Jewish fold, according to Paul Golin, associate director of the Jewish Outreach Institute. The interfaith outreach world has been invigorated by the 2005 Greater Boston Jewish Community Study, conducted by Brandeis University’s Steinhardt Social Research Institute. That survey showed that in Boston, where the community makes a point of reaching out to interfaith families, some 60 percent of intermarried families are raising their children Jewish. The New York-based JOI administrates www.themotherscircle.org, an online community of 400 non-Jewish mothers who are raising their children Jewish. It’s designed to give them peer support and connect them with educational resources, such as how to bring up a Jewish child, how to tell non-Jewish grandparents that they are raising children Jewish and how to prepare for a brit milah. But Donald Sylvan, president of the Jewish Education Service of North America, warns that the opportunity is valuable only if the community figures out not just how to bring in new parents, but how to guide them further into the community afterward.